Objective: Depression imposes a huge health problem in the world. Recent studies report that berberine has neuroprotective effects. This study was investigated to evaluate the effects of berberine on depression and the potential underlying mechanisms. Methods: This experimental study included 48 mice, 8 CD1 mice and 40 C57 mice. Experiments were performed in the Laboratory Animal Center of China Three Gorges University, between May 2016 and February 2017. Chronic social defeat stress (CSDS) was used to build the depressive-like behaviors model. Three behavior tests, quantitative polymerase chain reaction, and Western blot were used to assay the changes in vivo. Results: We found that, in mice model induced by CSDS, berberine treatment increased mobility times in forced swim test and tail suspension test and reduced corticosterone level in serum. Furthermore, berberine increased traveled distance, frequencies in enter the central square, and duration time on the center square in the open field test as well. 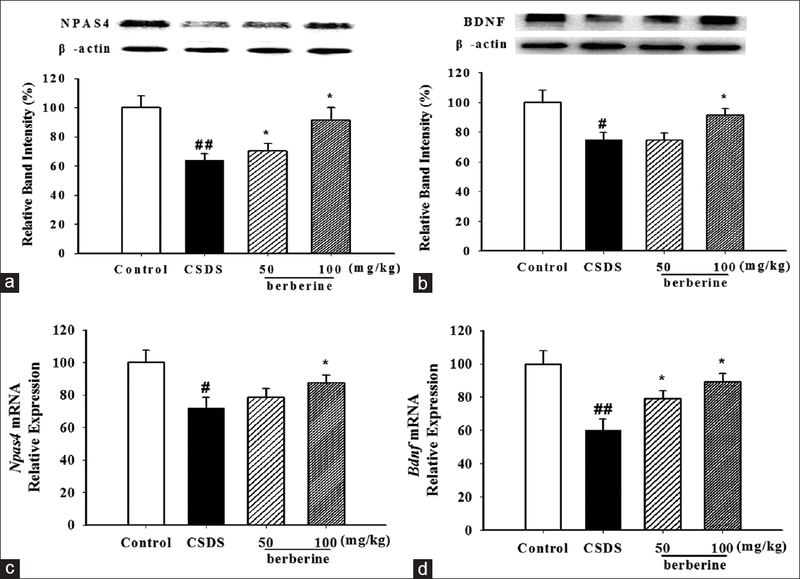 Further experiments showed that berberine treatment upregulated neuronal PAS domain protein 4 (NPAS4) and brain-derived neurotrophic factor (BDNF) protein/mRNA expressions in hippocampus tissue of CSDS mice. Conclusion: The present results suggested that berberine possessed properties in antidepressive-like behaviors, which might be partly attributed to upregulation of NPAS4 and BDNF expressions in hippocampus. Abbreviations used: CSDS: Chronic social defeat stress; BDNF: Brain-derived neurotrophic factor; NPAS4: Neuronal PAS domain protein 4; FST: Force swim test; TST: Tail suspension test; OFT: Open field test. Berberine upregulates neuronal PAS domain protein 4/BDNF signaling pathway. Depression, one of the most prevailing psychiatric disorders, is associated with notable changes within specific brain regions. To understand this disorder, various animal models, including chronic or acute stress, have been used to study the brain regions involved in the pathophysiological of depression. However, it is still elusive that the possible mechanism by which adverse stress exerts dysfunctional effects. Therefore, much additional work which was used to identify the potential mechanism involved in the depression-like behaviors will be required. All the above information will be necessary for the development of selective therapeutic strategies to treat depression. Over the past decade, intracellular signaling pathways, target genes, and neurotrophic factors have been identified to involve in the pathogenesis of depression. Multiple evidences have indicated that neurotrophic factors might serve as attractive therapeutic candidates for various neurodegenerative and neuropsychiatric disorders including depression, such as neuronal PAS domain protein 4 (NPAS4). NPAS4 is an activity-regulated transcriptional factor and regulates the formation of inhibitory synapses on excitatory neurons to maintain excitatory/inhibitory balance. It has been demonstrated that decrease of NPAS4 expression might be in response to the behavioral changes in anxiety and depression animal models., Moreover, NPAS4 is suggested to influence emotion and cognitive function by regulating cooperate and regulate expression of brain-derived neurotrophic factor (BDNF) gene in the hippocampus. Stress elevated glucocorticoid level, accompanied with depressive condition, reduces NPAS4/BDNF pathway in hippocampus region. Therefore, abnormal levels of NPAS4 are widely observed in depression. To investigate the pathophysiological mechanisms of depression, a proper animal model is needed. Recently, the common accepted experimental animal model to study potential mechanisms and treatment of depressive disease is the chronic social stress mice model. This model might be suitable since the phenomenon that the dominant animals bully the subordinate animals is similar to bullying among human social environment. However, whether NPAS4 is decreased in the hippocampus region of chronic social defeat stress (CSDS) mice is unclear. Recently, safe agents obtained from traditional herbs, such as berberine, have been extensively served as therapeutic approaches for depressive disease. Berberine, isoquinoline alkaloid present in several plants, is used to treat gastrointestinal infections in traditional Chinese medicine. Recently, an increasing number of studies have reported that berberine possessed outstanding antidepressant effects in depressive animal models established through different stresses.,, Nevertheless, there is no report suggested whether berberine possessed function in protection CSDS mice against depressive-like behaviors. Therefore, in our present study, CSDS animal model was used to explore the possible involvement of neurotrophic activity in the hippocampus in mediating the antidepressant effects of berberine, and further mechanisms were needed to explore. All laboratory operations, approved by the Ethics Committee of China Three Gorges University, aimed to reduce animal suffering. This experimental study included 48 mice, 8 CD1 mice and 40 C57 mice. Experiments were performed in the Laboratory Animal Center of China Three Gorges University, between May 2016 and February 2017. CD1 mice (8–9 weeks age, male and female) and C57/BL6j mice (8 weeks age, male) were both purchased from Beijing HFK Bioscience Co., Ltd. All mice, given freely food and water, were housed in a temperature- and relative humidity-controlled (22°C ± 2°C and 55% ±5%) room with a light/dark cycle of 12 h.
The CSDS model was established as described previously with minor modifications. CD1 mice (8–9 weeks age, male and female) and C57 male mice (8 weeks age, male) were numbered from 1 to 10, respectively. First cage fed number 1 male and number 1 female CD1 mice for 1 or 2 weeks; this environment produces territory consciousness in CD1 male mouse. After the CD1 female mouse isolated, number 1 C57 mouse, as an invader, was put into the first cage to make itself suffered attacks from the number 1 CD1 male mouse for 5–10 min. Then, the two mice were separated with transparent plastic clapboard with dense holes, which made the two mice still see and sniff each other but could not touch. The next day, the number 1 C57 mouse was put into the second cage housed with number 2 CD1 male mouse. The 3rd day, the same C57 mouse was put into the third cage housed with number 3 CD1 male mouse. These stresses sustained for 10 days and ensured that the same C57 male mouse suffered attacks from different CD1 male mice. At the end of experiment, all C57 mice were sacrificed between 9:00 AM and 10:00 AM to avoid fluctuations of hormone levels. The organs and blood samples were collected and prepared for following tests. C57/BL6J mice (8 weeks age, male), separately fed, were randomly divided into five groups (n = 8/group): (1) control group (nonstressed group); (2) CSDS group; (3) berberine group (25, 50, and 100 mg/kg/day in the drinking water). CSDS mice were received berberine treatment from the 1st day of model establishment, totally 10 days. The body weights of C57 mice were measured every day. Sucrose preference test was a classic method to detect loss of pleasure. The sucrose preference test was performed at the 11th day after CSDS establishment as described previously. Before the test, to prevent the location preference, normal water and 1% sucrose solution were put in the two sides of cage housed with one C57 mouse and switched positions for every 12 h for 2 days. On the 3rd day, the C57 mouse was fast for 24 h with no food and water. Then, sufficient food and water were provided; all C57 mice were allowed to drink freely for 1 h. At begin and end of free drink, weight of 1% sucrose solution and normal water were recorded, respectively. Formula: A/(A + B) × 100% was used to calculate the rate of sucrose preference in C57 mice. (A: 1% sucrose solution consumption weight and B: normal water consumption weight). The levels of mouse anxiety and locomotor activity were assessed by open field test (OFT). The yellow sentence changed into:Te OFT apparatus (height 40 cm, width 100 cm, length 100 cm) with the floor divided into 25 equal areas (20 × 20 cm). At the beginning of the OFT, one mouse was put into the boxes and left free to explore for 1 h under low light conditions (5 lux). The total distance traveled in the open field, the number of entries, and duration time spent in the center field were all recorded. This test was carried out after OFT according to the method of Porsolt et al. C57 mice were forced to swim in a jar (15 cm diameter and 30 cm height) filled with 10 cm water (25°C ± 2°C). C57 mice were allowed to swim for 6 min. During the first 2 min, C57 mice remained to struggle to get out of the water. After struggling time passed, animal gradually gave up and floated (immobility) inside the jar. The total record times of immobility (floating without movements necessary to keep their head above water) were the last 4 min. The tail suspension test (TST) was performed after 11 days of CSDS as described previously. A rack (60 cm high) was placed in a quiet experimental environment. A tongs, used to clamp a C57 mouse tail (1 cm to the end of the tail), was then put on the shelf of the rack to make the C57 mouse upside down. The C57 mouse struggled to overcome the uncomfortable postures. We recorded the immobility time within 5 min. The corticosterone level in serum was quantified using a commercial ELISA kit (Hengdailao, Shanghai, China) according to the manufacturer's instructions. Quantitative polymerase chain reaction (Q-PCR) was performed according to the previously described procedure. One-Step SYBR® PrimeScript™ reverse transcription-PCR kit (Takara, Japan) and real-time quantitative PCR instrument (Agilent Technologies Co., Ltd.) were used to analyze PCR results. The following primer sequences were designed according to the corresponding C57 mouse genes: 5′-GGAAGTTGCTATACCTGTCGG-3′ and 5′-GTCGTAAATACTGTCACCCTGG-3′ for NPAS4, 5′-AAGTCTGCATTACATTCCTCGA-3′ and 5′-GTTTTCTGAAA GAGGGACAGTTTAT-3′ for BDNF, and 5′-ACATTGTTGCCATC AACGAC-3′ and 5′-ACGC CAGTAGACTCCACGAC-3′ for GAPDH (Invitrogen, Shanghai, China). To detect proteins expression difference in hippocampus tissue, Western blotting was used. Isolated hippocampus was homogenized for 30 s on ice in radioimmunoprecipitation assay buffer, and then the protein concentration was measured using commercial kit (Boster Technology, Wuhan, China). Equal amounts of protein were resolved by 8% SDS-polyacrylamide gel electrophoresis and transferred to nitrocellulose membranes (Millipore, MA, USA). After blocked by 5% skim milk powder in Tris-buffered saline with Tween 20, nitrocellulose membranes were incubated with NPAS4 (1:200, Santa Cruz Biotechnology, Santa Cruz, CA, USA), BDNF (1:1000, Cell Signaling, MA, USA), and β-actin (1:3000, Cell Signaling, MA, USA) antibodies, respectively, in 1% skim milk solution, followed by incubation with a horseradish peroxidase-conjugated secondary antibody (Wuhan Goodbio Technology Co, Ltd, China) for 2 h at room temperature. Protein bands were detected using chemiluminescence kit (Thermo, Rockford, USA) and visualization instrument (Clinx Science Instruments Co., Ltd.). One-way analysis of variance followed by the Bonferroni test for post hoc comparisons was used to analyze the data. SPSS 19.0 (Chicago, IL, USA) was used for all statistical procedures. Differences with P < 0.05 were considered statistically significant. The results were expressed as mean ± standard error of the mean. To detect antidepressant effects of berberine, we adopted depression model induced by CSDS. Experimental procedure design was shown in [Figure 1]. At the end of 10-day treatment, sucrose preference test and corticosterone level in C57 mice were tested. Body weights of C57 mice were daily recorded. 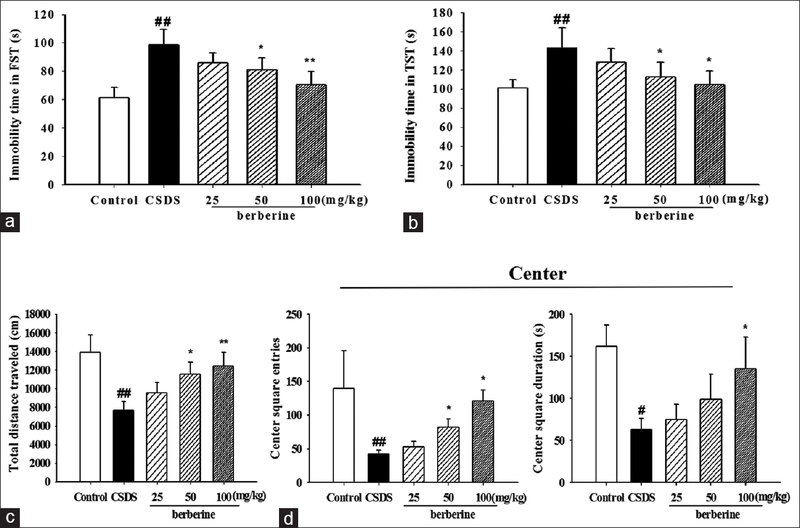 [Figure 2]a and [Figure 2]b shows that, at the end of experiment, compared with control mice, the consumption of sucrose solution significantly decreased in CSDS mice (P < 0.01), accompanied with serum corticosterone level rose (P < 0.05), berberine at 50 mg/kg and 100 mg/kg partly reversed the above phenomenon (P < 0.05), and berberine at 100 mg/kg increased the sucrose preference ratio (P < 0.05). Meanwhile, body weights of CSDS mice were lower than control mice [Figure 3], berberine treatment, at all dosage, increased body weights of CSDS mice (upward trend); however, there is no statistically significant. Immobility times in forced swim and tail suspension are common behavioral indicators to test whether CSDS model is successfully established and treatment of berberine. As shown in [Figure 4]a, at the end of 10-day treatment, chronic social defeat caused an increase in the duration of immobility time in forced swim test (FST) compared with that of control mice [[Figure 4]a, P < 0.01]. A similar phenomenon was observed in TST [Figure 4]b, P < 0.01]. Furthermore, in the OFT test, CSDS mice treated with berberine as well as exhibited longer travel distance [Figure 4]c, P < 0.01], more frequency in enter the central square, and more time on the center square [Figure 4]d, P < 0.01], which suggesting that berberine also increased exploration and the locomotor activity in the CSDS mice. Therefore, berberine treatment (50 mg/kg and 100 mg/kg) improved behavioral defects in the CSDS mice. To study the underlying mechanisms of berberine protecting against depressive-like behaviors, NPAS4 and BDNF expression were tested. The results showed that the expressions of NPAS4 [Figure 5]a and [Figure 5]b and BDNF [Figure 5]c and [Figure 5]d in the hippocampus of CSDS mice were reduced. After berberine treatment (50 and 100 mg/kg), these cytokines were normalized in terms of mRNA and protein levels, especially at a dose of 100 mg/kg. Depression disease, a serious mental illness, has an estimated lifetime prevalence of about 15%–20% and imposes a huge health problem in the recent world., Therefore, it is important to explore the underlying physiopathologic mechanisms and evaluate the treatment of it. Initially, a suitable animal model which simulates human condition of depression is needed. CSDS-induced depressive model was used in our study. The previous study suggested that social defeat could trigger depressive-like behaviors. In this model, competition awareness between C57 and CD1 mice for territory lead them fight until C57 yielded. The defeat C57 mice might have significant mood disorders after long time of the chronic physical and psychological stress. To verify whether the CSDS model was successfully established in our study, sucrose preference, corticosterone level in serum, and some behavior indexes including FST and TST were used. Sucrose preference, mimic the mood of depressive disease patients, serves as an indicator of anhedonia-like behavior change. In the present study, decreasing amounts of sucrose solution consumption were observed in CSDS mice after receiving 10-day social defeat stress when compared with the nonstressed group. Chronic stress produces excessed glucocorticoid and eventually resulted in the decreasing proliferation rate of nerve cell, even apoptosis. Clinical studies also observe significantly elevation cortisol levels in depressive disease patients., In our study, ELISA test showed the elevation of serum corticosterone levels in mice suffered chronic social defeat. In addition, immobility time, tested in FST and TST, is a valuable index to indicate despair or a depression-like state., CSDS mice in the present study displayed obvious increasing in immobility times in the FST and TST. Therefore, CSDS mouse is a proper animal model to explore the potential mechanisms and evaluate compounds with antidepressant-like effects. On the basis of CSDS mice, the antidepressant-like effects of berberine were evaluated. Berberine, an isoquinoline alkaloid isolated from the Chinese herb Coptis Chinensis (Huanglian), possesses various pharmacological actions and biological activities. Recently, berberine exerts excellent effects on neuroprotection such as Alzheimer's disease and depressive disorders. Previous studies demonstrated that berberine prevented morphine and corticosterone-induced depressive-like behaviors, reduced the immobility times in FST and TST.,, In our results, we found that treatment of berberine (100 mg/kg) significantly elevated sucrose solution consumption and declined the immobility times in FST and TST, meanwhile reducing serum corticosterone levels. 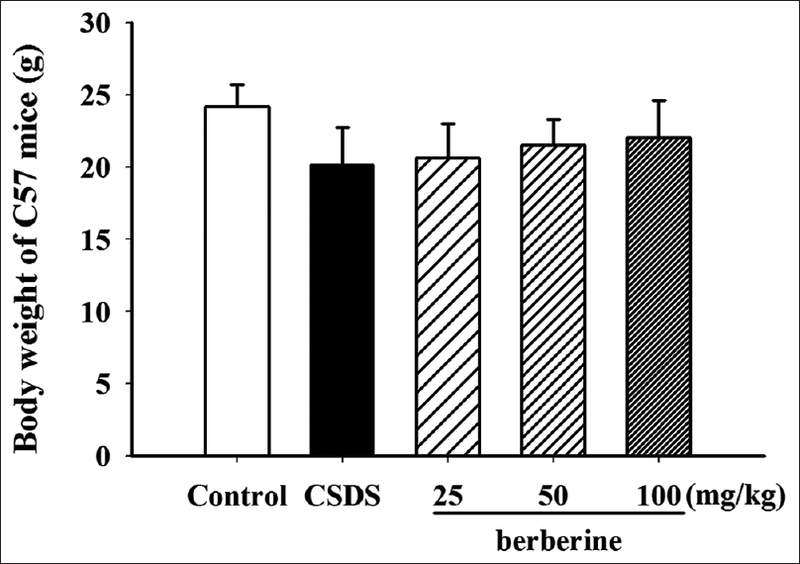 In additional, berberine increased body weights of CSDS mice at the end of the experiment. Taken together, all these results, including ours, suggest that berberine treatment protects CSDS model against depressive-like behavioral change, indicating that berberine is a promising agent to prevent depressive diseases. To further investigate the underlying mechanisms related with the antidepressant-like effects of berberine, we tested the expressions of NPAS4 and BDNF. It is reported that NPAS4, regulating the formation of inhibitory synapses on excitatory neurons to maintain homeostasis in excitatory/inhibitory neuron activity, has been shown to be associated with behavioral changes in many different mood disease models. In chronic unexpected mild stress model and posttraumatic stress disease model, NPAS4 expressions in both model groups are lower compared with normal mice., Dysregulation of NPAS4 is also observed in bipolar disorder and cognitive disorder., Moreover, NPAS4 influences emotional function by regulating BDNF expression in the hippocampus, which plays an important role in the etiology of depressive disease. Clinical studies suggested that major depressive disorder patients accompanied with lower BDNF level, which increases to normal level after antidepressant cure., Here, we found that CSDS mice showed decreased NPAS4 and BDNF protein expressions, which were elevated by berberine treatment for 10 days. Furthermore, high-level corticosterone is observed in CSDS model, which is agreed with previous studies. Chronic stress leads to hypothalamic–pituitary–adrenal-axis dysregulation and glucocorticoids oversecretion accompanied with reduced NPAS4 expression in hippocampus., Our study found that, after berberine treatment, corticosterone level reduced compared with CSDS mice. We speculated that another way in berberine protecting against depressive disease was reducing corticosterone level. Therefore, the potential antidepression mechanisms of berberine might be involved in elevation NPAS4 and BDNF expressions. Shen et al. also reported that berberine possessed antidepressant-like effects and postulated mechanisms might be partially mediated by upregulation of BDNF in hippocampus. There are some differences between our present investigation and Shen et al.' study. First, the depressive-like behaviors' animal model was different in these two studies. Second, for the aspect of mechanism, downregulation of BDNF was induced by corticosterone in Shen et al. 's study; however, we found in our study, BDNF expression was downregulated after chronic social stress. Anyhow, both the investigation revealed that berberine possessed antidepressant-like effects. The present study demonstrated that CSDS mice are proper models to study depressive disease. Using this model, we found that berberine could serve as an effective agent that ameliorated depressive-like behaviors in CSDS model by elevating NPAS4 and BDNF expressions; however, the exact mechanisms of berberine in the treatment of major depression are further needed. We gratefully acknowledge the Yichang Key Laboratory of ischemic cardiovascular and cerebrovascular disease translational medicine foundation (2017KXN09) for generous financial support. Hidaka BH. Depression as a disease of modernity: Explanations for increasing prevalence. J Affect Disord 2012;140:205-14. Zhang Z, Fei P, Mu J, Li W, Song J. Hippocampal expression of aryl hydrocarbon receptor nuclear translocator 2 and neuronal PAS domain protein 4 in a rat model of depression. Neurol Sci 2014;35:277-82. Jaehne EJ, Klarić TS, Koblar SA, Baune BT, Lewis MD. Effects of npas4 deficiency on anxiety, depression-like, cognition and sociability behaviour. Behav Brain Res 2015;281:276-82. Bloodgood BL, Sharma N, Browne HA, Trepman AZ, Greenberg ME. The activity-dependent transcription factor NPAS4 regulates domain-specific inhibition. Nature 2013;503:121-5. Furukawa-Hibi Y, Yun J, Nagai T, Yamada K. Transcriptional suppression of the neuronal PAS domain 4 (Npas4) gene by stress via the binding of agonist-bound glucocorticoid receptor to its promoter. J Neurochem 2012;123:866-75. Jianhua F, Wei W, Xiaomei L, Shao-Hui W. Chronic social defeat stress leads to changes of behaviour and memory-associated proteins of young mice. Behav Brain Res 2017;316:136-44. Shen JD, Ma LG, Hu CY, Pei YY, Jin SL, Fang XY, et al. 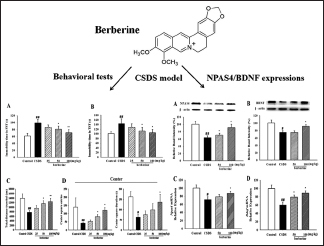 Berberine up-regulates the BDNF expression in hippocampus and attenuates corticosterone-induced depressive-like behavior in mice. Neurosci Lett 2016;614:77-82. Peng WH, Lo KL, Lee YH, Hung TH, Lin YC. Berberine produces antidepressant-like effects in the forced swim test and in the tail suspension test in mice. Life Sci 2007;81:933-8. Lee B, Sur B, Yeom M, Shim I, Lee H, Hahm DH, et al. Effect of berberine on depression- and anxiety-like behaviors and activation of the noradrenergic system induced by development of morphine dependence in rats. Korean J Physiol Pharmacol 2012;16:379-86. Kulkarni SK, Dhir A. On the mechanism of antidepressant-like action of berberine chloride. Eur J Pharmacol 2008;589:163-72. Venzala E, García-García AL, Elizalde N, Delagrange P, Tordera RM. Chronic social defeat stress model: Behavioral features, antidepressant action, and interaction with biological risk factors. Psychopharmacology (Berl) 2012;224:313-25. Mao QQ, Ip SP, Ko KM, Tsai SH, Che CT. Peony glycosides produce antidepressant-like action in mice exposed to chronic unpredictable mild stress: Effects on hypothalamic-pituitary-adrenal function and brain-derived neurotrophic factor. Prog Neuropsychopharmacol Biol Psychiatry 2009;33:1211-6. Porsolt RD, Bertin A, Jalfre M. Behavioral despair in mice: A primary screening test for antidepressants. Arch Int Pharmacodyn Ther 1977;229:327-36. Varty GB, Cohen-Williams ME, Hunter JC. The antidepressant-like effects of neurokinin NK1 receptor antagonists in a gerbil tail suspension test. Behav Pharmacol 2003;14:87-95. Jiang B, Xiong Z, Yang J, Wang W, Wang Y, Hu ZL, et al. Antidepressant-like effects of ginsenoside rg1 are due to activation of the BDNF signalling pathway and neurogenesis in the hippocampus. Br J Pharmacol 2012;166:1872-87. Pathak L, Agrawal Y, Dhir A. Natural polyphenols in the management of major depression. Expert Opin Investig Drugs 2013;22:863-80. Schloesser RJ, Lehmann M, Martinowich K, Manji HK, Herkenham M. Environmental enrichment requires adult neurogenesis to facilitate the recovery from psychosocial stress. Mol Psychiatry 2010;15:1152-63. Willner P. Chronic mild stress (CMS) revisited: Consistency and behavioural-neurobiological concordance in the effects of CMS. Neuropsychobiology 2005;52:90-110. Schoenfeld TJ, Gould E. Differential effects of stress and glucocorticoids on adult neurogenesis. Curr Top Behav Neurosci 2013;15:139-64. Mitchell AJ. Glucocorticoids and the genesis of depressive illness. Br J Psychiatry 1994;164:853-4. Hinkelmann K, Moritz S, Botzenhardt J, Muhtz C, Wiedemann K, Kellner M, et al. Changes in cortisol secretion during antidepressive treatment and cognitive improvement in patients with major depression: A longitudinal study. Psychoneuroendocrinology 2012;37:685-92. Strekalova T, Steinbusch HW. Measuring behavior in mice with chronic stress depression paradigm. Prog Neuropsychopharmacol Biol Psychiatry 2010;34:348-61. Kulkarni SK, Dhir A. Berberine: A plant alkaloid with therapeutic potential for central nervous system disorders. Phytother Res 2010;24:317-24. Cai Z, Wang C, Yang W. Role of berberine in Alzheimer's disease. Neuropsychiatr Dis Treat 2016;12:2509-20. Singh IP, Mahajan S. Berberine and its derivatives: A patent review (2009-2012). Expert Opin Ther Pat 2013;23:215-31. Zhang Z, Fei P, Mu J, Wang H, Li W, Song J, et al. Decreased expression of neuronal per-arnt-sim domain protein 4 gene in the hippocampus of a post-stroke depression rat model. Exp Ther Med 2014;7:1045-9. Spiegel I, Mardinly AR, Gabel HW, Bazinet JE, Couch CH, Tzeng CP, et al. Npas4 regulates excitatory-inhibitory balance within neural circuits through cell-type-specific gene programs. Cell 2014;157:1216-29. Psychiatric GWAS Consortium Bipolar Disorder Working Group. Large-scale genome-wide association analysis of bipolar disorder identifies a new susceptibility locus near ODZ4. Nat Genet 2011;43:977-83. Floor K, Barøy T, Misceo D, Kanavin OJ, Fannemel M, Frengen E, et al. A 1 Mb de novo deletion within 11q13.1q13.2 in a boy with mild intellectual disability and minor dysmorphic features. Eur J Med Genet 2012;55:695-9. Fernandes BS, Gama CS, Ceresér KM, Yatham LN, Fries GR, Colpo G, et al. Brain-derived neurotrophic factor as a state-marker of mood episodes in bipolar disorders: A systematic review and meta-regression analysis. J Psychiatr Res 2011;45:995-1004. Li S, Wang C, Wang M, Li W, Matsumoto K, Tang Y, et al. Antidepressant like effects of piperine in chronic mild stress treated mice and its possible mechanisms. Life Sci 2007;80:1373-81. Pariante CM, Lightman SL. The HPA axis in major depression: Classical theories and new developments. Trends Neurosci 2008;31:464-8. Furukawa-Hibi Y, Nagai T, Yun J, Yamada K. Stress increases DNA methylation of the neuronal PAS domain 4 (Npas4) gene. Neuroreport 2015;26:827-32.